Class A fire labeling means our paneling has been tested by HPVA under the ASTM E84 tunnel test guidelines and has achieved a Flame Spread index of Class A with a rating of 25 or less and a Smoke Developed Index of 450 or less. AFP has been manufacturing fine architectural wood doors for the past 25 years, servicing the commercial office and residential markets. We are geared to the contract business and its demanding quality standards and schedule requirements. As a custom manufacturer, we offer architects, designers, contractors, millworkers and clients exceptional flexibility to suit their specifications and aesthetic criteria. All our products are made to order with careful attention to detail. Consistent high quality and lead time reliability have become our trademark. We provide a wide range of wood veneered flush doors for interior use, available in slab condition or beveled, machined and factory finished to your specifications. And because of our expertise in woodworking and finishing, we are able to produce paneling and other millwork items, as well as furniture products such as veneered and laminated table tops. Please contact us for more information, especially if you wish to enhance your interior design with a perfect match between your doors and other wood surfaces. MATERIALS TO FIT YOUR DESIGN. CRAFTSMANSHIP TO FIT YOUR STANDARDS. To manufacture durable doors, only the best materials available are used. Our stringent quality control begins with the selection of properly kiln-dried and balanced solid woods to prevent warpage, as well as the required density core products and premium-grade face materials. Since we pride ourselves in the appearance of our veneered doors, special attention is given to the hand-matching and splicing of all veneers to our demanding specifications. We offer all commercially available domestic and imported veneers, including reconstituted veneers. We provide any veneer cut and match available. We also offer all specified high- pressure decorative laminates, as well as hardboard and overlays for paint finishes. 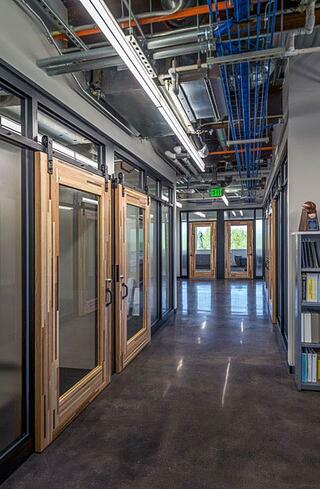 Standard doors are available in 1-3/4" standard thickness and other thicknesses by request. The unitized core system bonds the stiles, rails and particle board into a stabilized, stress-free assembly which is sanded to tight tolerances. This assures a flat, smooth surface of uniform thickness, eliminating telegraphing regardless of facing material. 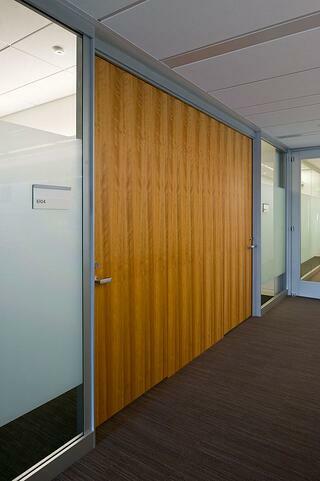 The 5-ply wood or painted construction method for veneered doors further results in a clean, attractive edge detail. We also offer a bullnose edge detail for pivot-hinged doors which are widely used by movable wall system manufactures. Few things match the beauty and elegance of a well-finished door. To achieve the level of quality unattainable with field-finishing techniques and to reduce installation costs, we recommend that you ask for factory-finished doors. Our factory finishes are second to none. All surfaces are first prepared with abrasive planing and careful hand-sanding. For veneers with a clear coats production finish, two coats of sealer and two coats off topcoat are applied, with hand-sanding between coats. If a color match is specified, the required stain is applied before sealer and topcoats. We can match virtually any tint or color and will submit a sample for your approval, including any special finishes. We also offer a superior quality paint finish on hardboard-faced doors, with primer, paint and varnish coats resulting in an even, solid appearance, matched to any color specified. Plastic laminate doors receive the same paint or stain finish on both edges to match the face color. Opening for glass inserts are made to specifications, any size within the limits of industry standards for glass surfaces. We provide integrated hardwood framing, bonded to the core, for added stability and to prevent the splitting of face materials in the corners. Glass is optional and can be factory-installed on request. Design Consultation, Sourcing, Selection, Coordination, and Allocation of veneer including multi-faceted projects, which integrate all veneered interior elements including furniture, wall panels, doors, ceiling panels, elevator panels, equipment, lockers, movable partitions, millwork, and cabinetry. Assisting in the gathering of information to produce a wood paneling project that meets our customer needs as the architectural specifications require. Working with your order through its critical path from beginning to end to assure a successful punch list. Partnering with our customers to research and develop production techniques for custom products.